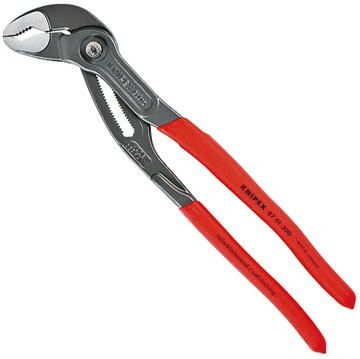 Hightech Water Pump Pliers. 30 adjustment positions. 2 3/4 capacity for pipe. Adjustment at the touch of a button. Self-locking on pipes and nuts: no slipping on the workpiece and low handforce required. Gripping surfaces with special hardened teeth, teeth hardness approx. 61 HRC: low wear and stable gripping.